John Duns Scotus was known as the “Subtle Doctor” for a reason; a medieval Franciscan and philosopher, Scotus’ thought was so deep and complex that, although it was occasionally controversial in his own time, it nonetheless continues to be studied and have an important influence on Catholic doctrinal concepts to this day. Born into a wealthy farming family at Duns, Scotland, about 1265 (Scotia is the Latin word for Scotland, hence the name John Duns Scotus), John joined the Franciscan Order in 1280, at about the age of 15. He distinguished himself academically from the beginning, studying at both Oxford University and later at the University at Paris. He was ordained a priest there in 1291 and continued his education until 1297, when he returned to England to become a lecturer at Oxford and Cambridge. Four years later he returned to Paris to teach and complete his doctoral degree. John Duns Scotus was part of a theological movement in the 13th century known as Scholasticism, in which theologians began to incorporate reason with theology to better understand the mysteries and teachings of the Church. To demonstrate that faith and reason were not in conflict with each other, they began to synthesize Biblical studies and the writings of the early Church Fathers with the study of philosophy. The followers of Duns Scotus and his school of thought were known as “Scotists;” they were often at odds with the followers of another Scholastic theologian prominent during this period, St. Thomas Aquinas. Though the “Scotists” and the “Thomists” disagreed on some things, they agreed with one another on the use of reason and the resulting intelligibility of all things. One familiar idea that Duns Scotus defended was the argument in favor of free will. Some philosophers at the time maintained that free will was an illusion; instead, they said, people are controlled primarily by forces that exist outside themselves. Duns Scotus countered their claim with the following example: If he were to begin beating someone who denied free will, that person would, in all likelihood, tell him to stop. But if Duns Scotus didn’t have free will, he would not be able to stop, because he would be subject to something outside himself and beyond his control. It was the kind of example that his students would not soon forget. In addition to developing a complex argument for the existence of God, Duns Scotus was also one of the first major philosophers to successfully defend the doctrine of the Immaculate Conception. He was so persuasive that the University of Paris, where he was teaching, officially adopted his position in 1307; centuries later, it was the work of John Duns Scotus that Pope Pius IX relied on when he defined the dogma of the Immaculate Conception for the entire Church in 1854. 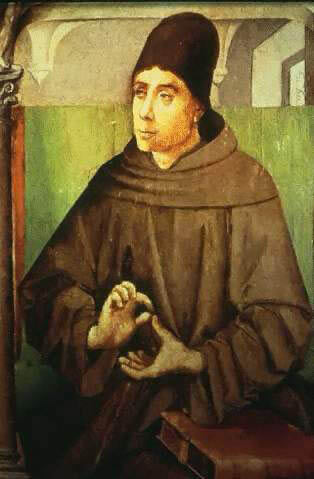 Blessed John Duns Scotus died of natural causes in November 1308, and was buried near Cologne, Germany. Beatified by Pope St. John Paul II in 1991, his feast day is Nov. 8. “Blessed John Duns Scotus“. CatholicSaints.Info. August 18, 2017. Minges, Parthenius. “Bl. John Duns Scotus.” The Catholic Encyclopedia. Vol. 5. New York: Robert Appleton Company, 1909. Schreck, Alan. “Catholic Church History from A to Z.” Michigan: Servant Publications, 2002.